Located in the Old Town Historic District, Rain Cafe and Lounge is a purveyor of casual American Eclectic dining and atmosphere infused classic and original cocktails. Rain opened in May 2009 and is located on Historic Douglas Avenue across from the Eaton Luxury Apartments. It has progressed into a local favorite and now a restaurant serving the downtown and oldtown neighborhoods, as well as Arena Event attendees due to its proxemity (1 block north of the Intrust ARENA). It is an every-crowd destination at night for casual lounging with friends, and is known for the colorful, eclectic mix of friendly patrons that can always be found there. Rain's interior reflects the hip sensibilities of the surrounding area while also creating a modern private environment for socializing. 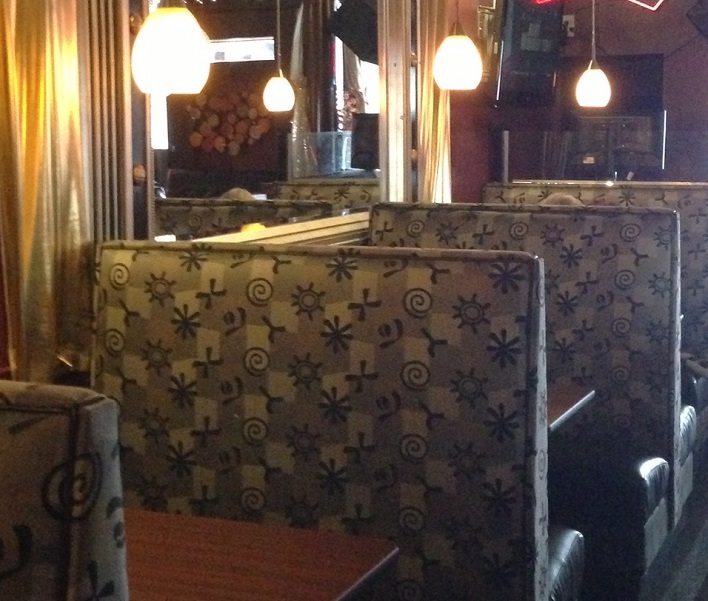 The restaurant offers options to meet in both cozy or open spaces-and features a unique patio bar with darts and a segregated pool table area for fun. Business amenities include USB chargers and power outlets at booth tables and bar areas, as well as ample Wi-Fi throughout the facility. Fresh, house fresh cut fries covered in marinara, mozzarella and pepperoni are broiled until golden and finished with fresh basil. Creamy spinach dip topped with cheese and broiled until golden brown, served with crostini bread crisps. Fresh and crispy veggie mix of chopped broccoli, Brussel sprouts, cabbage, kale, chicory, dried cranberries and roasted pumpkin seeds in a Poppy Seed dressing. Fresh mixed greens tossed in your choice of Blue Cheese or house made Ranch dressings topped off with tomato, turkey, ham, bacon, blue cheese crumbles and croutons. A fresh fried taco shell with beef, beans, rice, mixed greens, tomato and onions topped off with shredded cheese, house made salsa and sour cream. Mixed greens, pickled red onion and cucumber tossed in a Citrus vinaigarette. Please ask your server for our soup of the day! All items served with your choice of a side salad, cup of soup or fresh cut fries unless otherwise stated. Buttermilk, hand-battered fried chicken with bacon, swiss cheese, lettuce, tomato pickled onions and our house made Ranch dressing. A half-pound of grilled corned beef with swiss cheese, sauerkraut and Thousand Isle dressing on rye bread, served with our fresh cut fries. A Reuben lovers Rueben! Roasted tomatoes, mozzarella and creamy balsamic aioli finished with fresh basil on a toasted baguette. Grilled, sliced smoked turkey with lettuce, tomato, bacon and mayo served on wheat berry bread. Classic grilled steak or chicken with onions, mushrooms and cheese served on fresh Bolillo bread. Our house smoked pulled pork in a sweet BBQ sauce topped with Poppy Seed coleslaw on fresh Bolillo bread. Rain's burgers are seasoned in house and made from, 100% ground beef. Our sesame seed hamburger buns are locally sourced and preservation free. Add our house smoked Pastrami to any burger for $2! Our 1/3 lb. beef patty, with mustard, grilled onions and pickles. A house made burger patty with smoked bacon, lettuce, tomato and red onion topped with blue cheese crumbles. Grilled onions, mushrooms, garlic aioli and swiss cheese on our fresh ground beef patty. A house made, 100% beef patty with lettuce, red onion, tomato and pickles topped with Thousand Island dressing. Our 1/3 lb. fresh beef patty loaded with sweet bacon, swiss cheese and our smokey BBQ sauce. We make our organic, seasoned chickpea patty in-house, fried and served with lettuce, tomoatoes, pickles and a creamy zatziki sauce- a true original taste! Our Penne Mac-n-Cheese dishes with a variety of tasteful infusions to make a super dee-lish meal! Our pulled pork brisket, onions, peppers, tomato and BBQ sauce are added to make this hearty skillet served dish a favorite! Two deep fried flour tortillas filled with ground beef, topped with lettuce shredded cheese and salsa served with rice and beans. Three fresh made corn tortillas filled with our grilled, marinated carne asada, topped with white onion, cilantro and served with lime wedges. Fresh flour tortilla filled with ground beef, rice, crema, tomato, onion and shredded cheese, topped with chili and queso. Served with a basket of fresh fried tortilla chips. a big slice of our House creamy cheesecake, served plain or with your choice of razberry or chocolate drizzle! a sweet shareable round shaped confection of chocolate & dulce de leche, that's then rolled in candied sprinkles! we also have ocassional special limited dessert offerings too! We open at 10:30 am and serve our Breakfast Buffet until 2 pm for just $7.99! $5 Big Mimosas and Blood Marys too! Sunday also features HALF PRICED BURGERS and WELLS all day! So have a REAL "Sunday Funday" with us next time! Stoli Citros Citrus Vodka, coconut rum, peach schnapps, and blue curacao, mixed with pineapple juice and lemon-lime soda. Don Julio Blanco Tequila, sweet and sour, triple sec and lime juice. Bacardi Torched Cherry Rum mixed with lemon-lime soda and a splash of grenadine. Smirnoff Fluffed Marshmallow Vodka, Kamora Coffee Liqueur mixed with half and half. Stoli Vodka mixed with our special Bloody Mary mix. Deep Eddy Ruby Red Grapefruit Vodka topped with club soda and garnished with a lime. Siete Leguas Reposado Tequila topped with Ruby Red Grapefruit juice, club and lemon-lime soda. Grey Goose Vodka, olive juice, served with two olives. Deep Eddy Lemon Vodka, a splash of Midori, topped with club soda and garnished with a cucumber slice. Bacardi Grand Melon Rum, Red Bull and a splash of cranberry juice. Deep Eddy Lemon Vodka with a splash of lemon-lime soda and a sugared lemon garnish. Smirnoff Green Apple Vodka, apple liqueur and a splash of cranberry juice. Ketel One Vodka, Raspberry Schnapps and pineapple juice. Stoli Vanilla Vodka, Disarrono Amaretto, pineapple juice and a splash of grenadine. Big and bold, dominated by full flavors of dried black cherries, jammy preserves, complex toasty vanilla, and spicy oak. Aromas of black cherry, ripe currant, fresh herbs and lightly roasted coffee lead to flavors of blackberry, black cherry, toasty oak, hints of spicy black pepper finishing with supple tannins and balance acidity. Aromas of ripe plum, cherry and cassis are accented witha hint of cola and vanilla. Flavors of rich ripe plums and juicy berries are accented with cassis, slight cola and fine, polished tannins on the finish. This merlot shows rich blackberry, plum and raspberry flavors with hints of vanilla and toasted French bread, with a finish that is smooth and velvety. Enticing aromas of bright, lifted cherry and raspberry are followed up with warm spices. Medium bodied with full flavors of luscious berries and baking spices, the finish is lingering and silky. Elegant aromas or black cherry, sweet plum, coco and violet lead to the palate of sweet, lush fruit flavors and hints of almond, complemented by balanced acidity and mellow tannins. Rich and deeply satisfying, it just might be your total dream wine. Deep in color, with juicy berry and plum flavors, a sensuous texture and refined tannins, it goes down like pure velvet. Commanding aromas of blueberry, caramel and toasted oak preview a bold palate full of concentrated blackberry, ripe plum, black cherry and milk chocolate, which leave a lasting impression with a polished, round finish. Aromas of ripe red and dark berry fruit, hints of pepper and creme de cassis are echoed on the palate leading to a soft, smooth finish. Jet black in the glass, it was inspired by the field blends made popular during Prohibition. Delivering rich aromas of blackberry preserves, cocoa, raspberry and caramel, it's juicy core of concentrated, dense blackberry and fig jam flavors finish with a hint of baking spice. The organic blend of super fruit including pomegranate, blueberry, blood orange and acai juices mean nearly 2x the antioxidants of regular red wine. It's also Certified Organic, deliciously refreshing and only about 140 calories a serving---what are you waiting for? A nose of honey and tropical fruit with notes of pineapple and peach lead into lush, tropical fruit on the palate, finishing with touches of sweet vanilla and butter cream. A touch of tropical, this wine is crisp, clean and bright with balanced acidity, which lets Monterey's signature flavors of lemon, lime and touches of apple shine through. Vibrant aromas of ripe peach, honeydew melon and citrus jump from the glass. With a medium body, a round mid palate and crisp acidity, the refreshing wine offers flavors of nectarine, melon and a hint of lime zest. Zesty and aromatic with lots of lively, penetrating fruit characters. A concentration of tropical and gooseberry flavors with an abundant bouquet, it is a wine that is always crisp, elegant and refreshing. The nose offers golden apple, honeydew pear and citrus notes, along with a pleasant touch of minerality. Medium-bodied, lively and clean, this is a well-balanced wine with crisp acidity and a satisfying finish. This slightly effervescent moscato is fruity and very inviting with intense scents of peaches and exotic fruit. Refreshing and delicately sweet, it reveals hints of stone fruit on the finish. A delicious Riesling for a new generation of wine drinkers, this wine is off-dry, yet fruity, crisp and well-balanced. Flavors of fresh apple and pear are accented with hints of grapefruit. The organic blend of super fruits including mango, peach and blood orange juices mean nearly 3x the antioxidants of regular white wine. It's also Certified Organic, deliciously refreshing and only about 140 calories a serving...why haven't you ordered yet? The aromas of watermelon, green grass and citrus are accented with hints of minerals, and as they carry through the palate, they dominate in a more dynamic way finishing with bright acidity. general information, upcoming events and any questions. Reservations strongly suggested for charity events and shows. DUE TO THE INFORMATION NEEDED TO ACCURATELY SERVE YOU AND ALL OF OUR GUESTS. TO RESERVE SEATING FOR EVENTS OR GATHERINGS.